This is the first blog of 2019 and we are all about empowering change. This year is going to be the year of handing the reins of change over to you, allowing you to make small changes that will build momentum and get you fired up for the seasons ahead. However, it is January and we have all spent various amounts of time curled up in front of fires and indulging in all sorts of holiday delicacies, so the biggest change we are probably going to be making is to get moving with consistency and as pain free as possible. We need to target areas in need of increased mobility to allow us to pursue our fitness goals, or just to simply ‘move freely’. But where to start? For me, 2018 drew to a close on the slopes of the Alps. I love skiing and luckily my family are very enthusiastic skiers. Enthusiasm, unfortunately, doesn’t prevent the kind of aches and pains that may come with the skiing territory and increase with age. There is much to be said for the empowering sense of well-being that comes with being out in the fresh air, on a picturesque mountain slope, but that fun can often be dampened by the pain of those cumbersome boots. Ski boots, surely one of the most uncomfortable pieces of footwear known to man, but a necessity if you want to ski. Like many people I suffer from ‘tight calf’ issues. I tend to hire my boots and loathe the end of the skiing day as my feet may become numb, calves ache or ankles stiffen, even removing the restrictive boots at the end of the day is difficult. As a fitness professional, radiographer, biomechanics coach and sports therapist, I wanted to address the ‘boot pain’ before heading off to the slopes. After attending the Elite Therapy for Performance study day back in November, highlighting ankle joint movement, I decided to think more about my own ankle biomechanics and skiing. The ski boot is a main piece of kit that ensures correct performance and support for the ankle. 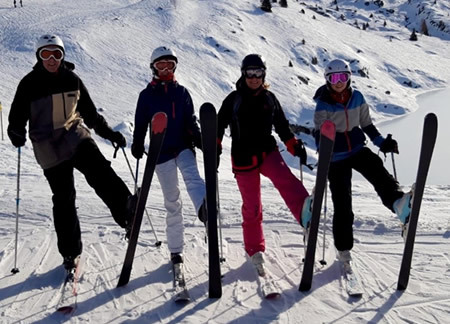 Traditionally, in order to address fitness on the slopes, we focus on exercises such as dynamic squats, squats against a wall or tree, core conditioning and aerobic fitness, all good. However, thinking ski boots; your ankles are in a permanent state of forward flexion with the boots a solid cast around the foot, ankle and lower leg to ensure good performance whilst protecting the joint from damage. If you have a decreased ability to forward flex at the ankle joint, this will leave you unable to remain comfortable in the booted position for a day’s skiing. Whenever seated, I performed simple movements of only the ankle joint, spelling out the alphabet with the foot, putting the joint through all its range of movements .I spent a few minutes each day on muscle energy techniques to help lengthen the calf plus an exercise to help improve forward flexion of the ankle using a heavy resistance band. This year, when I came to the end of the skiing day, the improvement was amazing. My boots definitely hurt less. I shared these exercises with my friends, of a certain vintage, who came skiing with us. They all reported pain free or almost pain free skiing. As society ages, more people will continue to ski as they get older. It’s really important to recognise that mobility of all the joints involved with the entire movement chain, especially the ankle joint, is essential. Even if you are not skiing, the ankle is involved in walking and we all want to keep doing that pain free….